Did you ever wonder what different virus infections you have had in your lifetime? Now you can find out with just a drop of your blood and about $25. Immune defense systems of many hosts produce antibodies in response to virus infections. These large proteins, which are generally virus specific, can block or inhibit virus infection, and persist at low levels for many years after the initial infection. Hence it is possible to determine whether an individual has had a virus infection by looking for anti-viral antibodies in the blood. Up to now the process of identifying such antibodies has been slow and limited to one or a few viruses. A new assay called VirScan allows unbiased searches for all the virus antibodies in your blood, providing a picture of all your past infections. To identify the human antivirome, DNAs were synthesized encoding proteins from all viruses known to infect humans – 206 species and over 1000 strains. These DNAs were inserted into the genome of a bacteriophage, so that upon infecting bacteria, the viral peptides are displayed on the phage capsid. These ‘display’ phages were then mixed with human serum, and those that were bound by antibodies were isolated. The DNA sequence of the phage genomes were then determined to identify the human virus bound by the antibodies. This method was used to assay samples from 569 humans. The results show that each person had been exposed to an average of 10 viruses, with a range from a few to over 20 (two individuals had antibodies to 84 different virus species!). 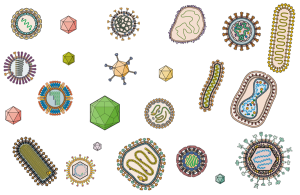 The most frequently identified viruses included herpesviruses, rhinoviruses, adenoviruses, influenza viruses, respiratory syncytial virus, and enteroviruses. The overall winner, found in 88% of samples, is Epstein-Barr virus. These results are not unexpected: all of us are infected with at least a dozen viruses at any time, and the viruses identified in this study known to infect much of the human population. What was surprising is the absence of some common viruses, such as rotaviruses, and the ubiquitous polyomaviruses. According to serological surveys, the most common human viruses are the small, single-stranded DNA containing anelloviruses. Yet the related torque teno virus was only found in 1.7% of samples. These differences are likely due to a combination of technical and biological issues (e.g., failure of antibodies to certain viruses to persist in serum). This new assay may one day become a routine diagnostic tool that is used along with complete blood counts and chemistries to know if a patient’s signs and symptoms might be attributable to a past virus infection. VirScan technology is not limited to virus infections – it can be used to provide a history of bouts with bacteria, fungi, and parasites. VirScan might also allow us to determine which virus infections are beneficial, and which contribute to chronic diseases such as autoimmune or neurodevelopmental disorders or cancer. The assay can be used to conduct unbiased population-based studies of the prevalence of virus infections and their possible association with these diseases. Such connections were not previously possible with antibody assays that search for one virus at a time. This approach was not only inefficient, but required guessing the responsible virus. Some other findings of this study are noteworthy. As expected, children had fewer virus infections than adults. HIV-positive individuals had antibodies to more viruses than HIV-negative individuals, also expected given the damage done by this virus to the immune system. Frequencies of anti-viral antibodies were higher outside of the United States, possible due to differences in genetics, sanitation, or population density. In most samples, there was a single dominant peptide per virus, although there were occasional differences among populations. This information might be useful for improving vaccines, or tailoring them to specific countries or regions. Update: It would be very informative to use VirScan to search for antibodies against viruses that are not known to infect humans. Other animal viruses, plant viruses, insect viruses: to which do a significant fraction of humans respond? The information might identify other viruses that replicate in humans and which might constitute future threats (or present benefits). The first technical issue is that against real antigens, antibodies tend to cluster toward cross-chain epitopes. Short peptides produced by synthetic methods can fold (or not fold at all) and present differently from the same sequence chopped up by the immune system from a mature protein. There is be a lot of difference between the techniques used to create a reliable detection antibody against a protein, and a reliable detection system for w/t antibodies. To achieve the former, all you need is to find one good epitope that will be reliably available. For the latter, to function as a control, you will need the complete viral particle in some cases. Keep in mind that the immune system narrows response pretty quickly. So, If the phage system doesn’t happen to produce the epitope for a particular set of antibodies to the most common real-world epitope, it will miss it. I’ve seen plots for presumed polyclones that were monoclonal in their binding. The second technical issue is that mature proteins of viruses may be glyco-proteins. This changes the epitope set. There is a difference between phage expression and mammalian/insect/reptile cell expression. The third technical issue might be the type of immunoglobulin produced. That rotavirus, for instance, doesn’t show up could be that IgA is present, and primary, but the detection system doesn’t detect its presence. IgA can be tricky, because it is very good at cross-linking two antigens, and hiding its heavy chains. I would expect to see at least some IgG as well, but there could be surprises there since rotavirus infects the intestinal lining compartment. There are a lot of unexplored nooks and crannies in immunology, and while I’m not saying this is the explanation, this assay may have bumped into one or two. A fourth area to consider is that antibodies are the method commonly used — but this is for historical reasons, and ease of assay. It’s good to keep in mind that antibodies do not cure disease. They can prevent infection if the virus dose is low enough. They aid in fighting off viruses. But an animal with T-cell response knocked out can have all the antibodies you want to give it, and it will die. Activated T-cells are what clear virus. There is a lot of misapprehension on this point. This assay is a fantastic effort. It’s a very nice stake in the ground, and an important piece of work. However, if a virus doesn’t show up, I would not consider that diagnostic. I think there is a lot of careful detail work to be done to validate this method. That validation is valuable work very much worth doing. I suspect it will take a combination of techniques to create a reliable assay. It is also likely to be the entry point to uncovering some interesting details about immunology. The number they came up with (the average person has been exposed to 10 virus species) seems incredibly low. I’ve been exposed to 10 virus species (or virus-derived proteins) just from my childhood vaccinations, then add to that all the herpesviruses, flus, noro- rota-, rhino-, adeno-, corona, and innumerable others. I would have imagined that the average person has been exposed to many dozens or even hundreds of viruses…. Glad that you covered this new test. Although in infancy, seems it will be a quantum leap in testing. I have M.E. and was pleased to read that already a researcher has seen the potential of using this test to help look for the cause(s) of M.E. Exciting times! As the test is not ready yet, I hope you’ll consider changing your second sentence which leads people to believe the test is available commercially now. And I hope that you’ll do a podcast soon exploring the potentials of this test. Great analysis. The other technology that will be combined with this is called PLATO. It will get most of the conformational antibodies but not those those that need PTMs. I was very surprised too! Just from vaccines there should be immunity to almost as many viruses. And most colds are viruses, and children get many colds (in the order of dozens) in the first years they are in daycare or school with many other children. There can be several explanations : not enough strains, leading to an underestimate; waning immunity; no detection of the antibodies in very small proportions, … But else, 10 is really low!